The purpose is to link your Carrot account with REIPro. Login to your REIpro account, click on the My Account tab, then Account Home then Advanced Settings. 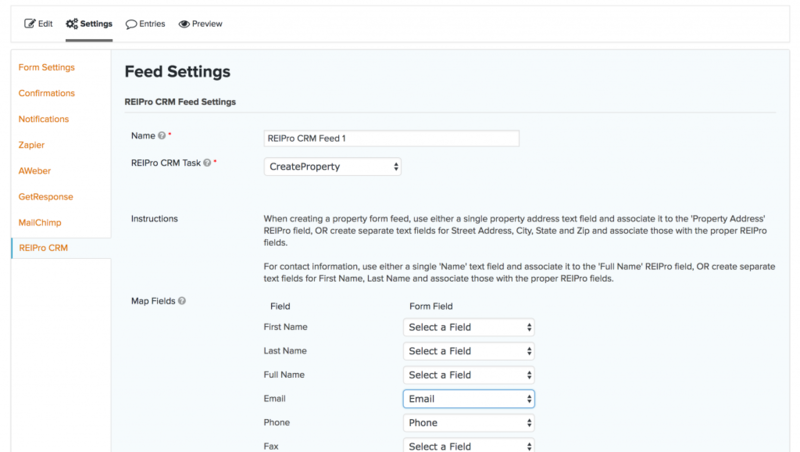 Go back to the Forms page, click on a form to add a feed to, then click on REIPro CRM under Settings on the chosen form. Match up your fields so they get mapped properly in REIPro. I.e. match up Email to Email, Phone to Phone. After the feed is added, it is a good idea to test the form. Simply visit your website, find the form you are working on, then fill it out. You should then see your lead come through to your REIPro account. *If you have multiple sites to connect to REI Pro use the same API Key on all sites.